GREENSBORO, N.C. (AP) — With demonstrators standing outside his concert protesting his presence, R. Kelly summoned his passionate fans to carry him through what has been a difficult week. Interspersing references to God with his suggestive lyrics and salty language, Kelly stirred up a crowd inside the Greensboro Coliseum on Friday to buoy him as he encountered longstanding allegations of mistreatment of women and an effort to get coliseum officials to cancel the concert. Well after his performance, however, the storms that started before he arrived continued to roil. Women’s groups had urged the Greensboro Coliseum to cancel, days after Kelly was disinvited from a concert in Chicago. Spotify announced it would no longer stream his music in its curated playlists. Although it didn’t announce the move, Apple’s music-streaming service also has stopped promoting Kelly’s music on some of the featured playlists that it shows its 40 million subscribers. Like Spotify, Apple Music still carries an extensive selection of Kelly’s songs in its library. Apple declined to further comment Saturday. Kelly said he was approached backstage to tone down his songs and language because there were families in attendance. Kelly then launched into his sexually suggestive repertoire. At one point, he rubbed a fan’s cell phone between his legs. He persuaded another to wipe his face, tongue and crotch with a towel. 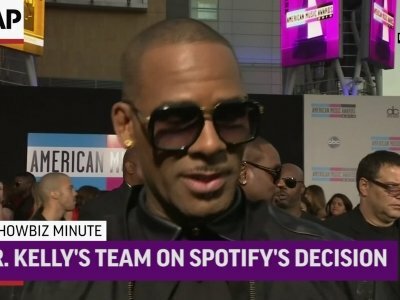 Kelly denies abusing anyone and faces no current criminal charges, and his fans weren’t giving up on their R&B superstar. “Everybody has some skeletons in the closet. I’m not going to tear him down, every good thing he does, because of something negative in his life,” said Clarissa Kelley of Lancaster, South Carolina. Protesters stood on the sidewalk outside the Greensboro Coliseum and criticized arena officials for declining to meet with a coalition of women’s groups that signed a letter citing a “long term history of sexual misconduct” by Kelly. “It’s important for the black community to stand up and hold him accountable for his actions,” said Omisade Burney-Scott, with the Sistersong, a reproductive rights group. R. Kelly is one of pop music’s best-selling artists, with hits including “Ignition,” ″I Believe I Can Fly,” ″Step in the Name of Love,” ″Same Girl” and “Bump N’ Grind.” He’s also written hits for Celene Dion, Michael Jackson and Lady Gaga. Kelly had been scheduled to be among the performers at a May 5 concert in Chicago, but was dropped as efforts by organizers of #MuteRKelly gained attention with support from Hollywood’s Time’s Up campaign. Spotify, citing its new policy against hateful content and conduct, announced Thursday that Kelly’s music is no longer available on the service’s owned and operated playlists and algorithmic recommendations. His music can still be found by those who search for it, but Spotify will not promote it. AP reporter Michael Liedtke contributed from San Francisco.